In 1998, an eight-month Washington Post investigation found that the Washington, D.C., Metropolitan Police Department had shot and killed more people per resident in the 1990s than any other large municipal police force in the country. According to the investigation, 85 people were shot and killed by the D.C. police between 1990 and November 1998. But today the number of fatal police shootings has declined sharply, from 16 in 1995 to two in 2006. 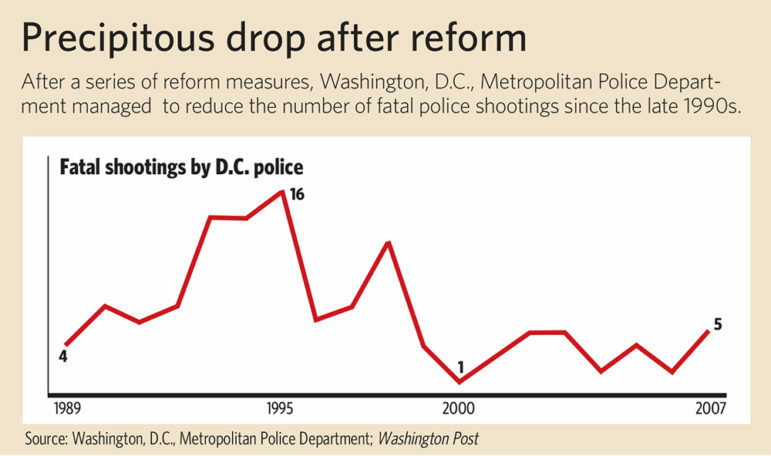 The D.C. police officials say the decline is due to a number of dramatic changes that were implemented following publication of the Post’s investigation by then-chief Charles H. Ramsey. In 2001, the D.C. police signed a memorandum with the U.S. Department of Justice agreeing to cooperate with a review of police shooting cases throughout the 1990s. According to Matthew Klein, the current director of internal affairs for the D.C. police, a number of new policies were also created to clarify when the use of force is appropriate and how to document it. This unit, named the Force Investigation Team, was similar to an internal affairs unit, except that it focused exclusively on issues of force, said Klein, who commanded the team from 2002 until he took on his current position in 2004. Since its inception, the unit’s scope has expanded beyond officer-involved shootings. It now investigates the department’s canine bite policy and the deaths of suspects in police custody. But the investigation of police shootings was only half the problem, Klein said. According to the Post investigation, the District added 1,500 officers— 35 percent of the force—in 18 months beginning in the summer of 1989 in a crash hiring program mandated by the U.S. Congress. These officers were inadequately screened, trained and supervised, the police department told the Post. Especially lacking, it said, was training on the department’s new standard- issue firearm, the Glock 9mm, intended to combat the increased firepower wielded by drug dealers. To correct this gap, Chief Ramsey ordered new firearms training for all 3,500 members of the force. Training was expanded to cover not only how and when to shoot, but also how not and when not to shoot, Klein said. A roleplaying component was also added. The number of police shooting fatalities declined from 12 in 1998 to one in 2000, leveling out to between two and five in the years following. Ramsey stepped down in January 2007, handing the reigns over to Cathy Lanier. Klein said that Lanier has continued pushing the importance of complying with the department’s agreement with the Justice Department. In addition, the D.C. police is now negotiating an amiable close to the agreement with the Justice Department. Frazier said police shootings and issues of police brutality could be quelled with a new recruiting philosophy and more consistent discipline after complaints of police abuse.